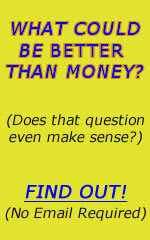 Okay, where do we start when it comes to making money online? Well... I'm going to assume you have a website (with the advent of Google Adwords the discussion below still applies, even if you don't have a website). So, ever heard of Amazon? Amazon sell books, right (and CDs, DVDs, toys...)! In effect, Amazon invented affiliate marketing! And right now, affiliate marketing is very big business. It is thought that by 2005, 25% of online sales will have originated on affiliate sites. And many online businesses now run affiliate programs. So it is possible to make a lot of money every month simply from a link to an affiliate program - no products of your own required! pays a good rate of commission. So Amazon definitely makes the sale (it's well-designed, has excellent customer service, and hence has very high conversion rates). But it pays a maximum of 15% commission, and you ONLY make commission on a previously-referred customer IF they click your affiliate link in the future - no lifetime commission here! Well, Affilorama offers over 80 free video and text affiliate marketing lessons,as well as a staff-moderated forum, free tools and a regularly updated blog. There are also paid training products available, should you wish to really develop as an affiliate marketer. However I can recommend a good, free, learning resource to do with affiliate marketing. Called The Affiliate Masters course, it is a bit of a heavy read, and -- like all good affiliate resources ;-) -- it does promote other services and products. What product/service does the Affiliate Masters course promote, then? Funnily enough, it's a resource ideal for affiliate marketers, beginners or otherwise. Are You Sure You Have No Product To Sell? Why Not Make Your Knowledge Sell! They say that there's a book in everyone, and that includes you! You probably know something that other people would pay to know. And if you think you're not a writer, YOU CAN LEARN! Creating and selling your very own, proprietary product could be an individual's best chance to succeed on the Net. How to make your knowledge sell - Find "the infoproduct within"
IT IS POSSIBLE to make money online with no product to sell. Simply sell other people's products via affiliate marketing, or create your own info-product - you can do it!